Hobbyists and furniture makers depend on our quality wood veneers. If you have often found yourself designing a piece based on a limited supply of wood veneers when you’d much rather go wild and do what you truly want, you’ll be happy to know that you can come to us at Sauers & Company Veneers for exactly that experience. We carry more than 125 species of wood veneers with six backing options, so you can take your project from vision to completion without making any compromises. As the industry leader in the production and supply of wood veneers, you can be confident you’ll find what you want and it will possess the quality you expect. Our products are produced in the United States so that the highest quality can be assured. In addition to enjoying having the largest wood species selection available to choose from, you will be able to get the format that suits your needs the best. 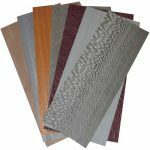 With options such as veneer sheets, edge banding, dyed wood veneers, and inlays, as well as the accessories you need and cost-saving hobby packs, your projects can get the start they need to be amazing. You will also find that our customer service department is ready to help with your selection of wood veneers and accessories. They’ll answer your questions and let you know what is in stock. If you need something that isn’t in stock, we’ll find it and get it shipped to you as quickly as possible. Sauers & Company Veneers has been in business for more than 50 years. We have supplied some of the largest furniture manufacturers in the world so whether you need a small supply of wood veneers for a hobby project or for a growing business in Los Angeles, California, don’t hesitate to contact us. At Sauers & Company Veneers, we create wood veneers for residents of Anaheim, Los Angeles, and San Francisco, California; Dallas, Texas; New York City; Chicago, Illinois; Boston, Massachusetts; Charlotte, North Carolina; and anywhere else in the United States.